Anaerobic composting is, aside from digging a pit or filling a bag, practically labor-free. It’s also a good method for those who don’t have room for a big compost heap or compost bin, or live in a community where such things are banned. After a time, the pit or bag can be emptied and will yield a fairly well-matured compost. Burying waste in a pit is an easy way to recycle. It also permits the material to stay warmer in the winter and damper in the summer. Underground rotting lets bacteria, anaerobic fungi and worms change stinky waste into (eventually) sweet-smelling soil. Just dig pits about 12″-14″ deep, dump the waste in, and cover with about 8″of soil. Don’t plant food crops over the pit for a year or so. 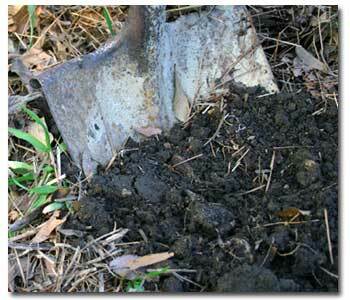 If you have a small garden that is worked by hand, try burying the waste in long trenches. Food crops can eventually be made directly on top of the covered trench, but it is not wise to do this too soon (non-food plants can be planted almost immediately). Allow plenty of time for decomposition before planting food crops. Growing food in too-raw garbage can spread diseases to us. Root crops, especially, may pick up parasites which have not yet been destroyed by the anaerobic processes–and give them to us. One of the best trenching methods involves rotating your trenches. Lay out your garden in wide rows, dividing each row into three narrow strips; one strip serves as a path (fallow soil), one as a mulching trench, and one for planting. Rotate every year for three years–in order: mulching trench to planting strip to fallow path. This gives you a safe time for the mulch to decompose and become safe to use for food crops. In the heat of summer, you can also use a black garbage bag. Fill it with about with one-third soil, and fill the rest with (vegetable) kitchen scraps and garden/lawn scraps. Add enough water to make mixture damp, but not soggy. Dampen the contents and mix thoroughly. Place in a warm, full-sun location (but protect it from animals – a repellent spray will be effective). Leave for about six weeks before opening. Warning–when you open the bag, hold your nose–anaerobic composting is a stinky process. Empty the contents of the bag in a corner of your backyard or leave the bag open, dig in some more soil and let the pile continue to work for a few days. Once the compost is exposed to oxygen, the odor soon goes away. You can then use it as a mulching compost or soil amendment (see above for cautions on food plants). Composting is a great way to recycle, as well as feed your soil. Try it!